-Munch en route to somewhere super important. Or in front of the TV. Whichever. Obviously, you can mix up these options with ingredient variations. Tuna, shrimp, pickled carrots and avocado are all tasty. I just happen to like the classic winning combo of salmon and cream cheese. Taste-wise, there was a clear winner to me: the original was better. Unsurprising, really. The light has fewer calories (95 to the original's 145), but it also has about 25% less alcohol. So, if you want to match someone beer for beer, or you don't want to get too dehydrated at a summer barbecue, Kirin Light is the way to go. Otherwise? Original, please. To my completely unrefined palate, it tasted like a German wheat beer, and it was perfect to pair with a really fatty dish like cream cheese/salmon. Oddly enough, Tim loved the Kirin Light. I'll be honest and say that each sip, to me, tasted like water with a beer aftertaste. Not a glowing recommendation, right? But he loved it, and thought it was really refreshing and something he could drink a lot of. Since he has undoubtedly consumed more beer in his lifetime than I have, I will have to assume he knows what he's talking about. I will say I was kind of disappointed when I read the label and saw that Kirin was another Anheuser-Busch product that was licensed - so, actually made in the United States. Not in a pretentious, "I only drink beer from abroad," kind of way, but I think it's fun to try food/beverages as they are consumed around the world. Apparently, some places in Japan and the U.S. serve draft Kirin with a frozen-beer slushy portion served on the top of the glass! I could get on board with that. Are you a sushi roll kind of person? Or do you prefer nigiri, cones, sashimi, etc? Nigiri, rolls, hand rolls - whatever. I like it all. Your thoughts on a beer slurpy. Go. I am intrigued. Yes to keeping the beer cold as you drink it, but I'm not sure if it would be too cold to have any real flavor. Side bar: now I want a wine slurpy. A lot. 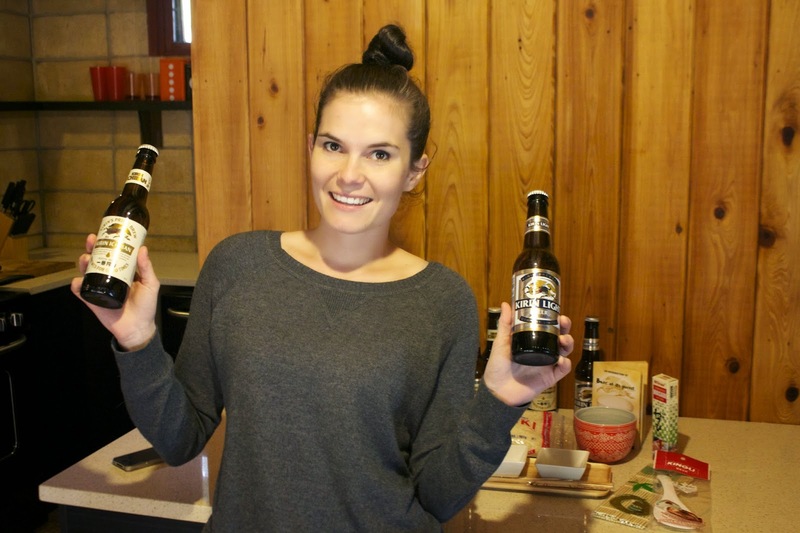 Learn more about Kirin Ichiban and their partnership with Iron Chef star Candice Kumai on Facebook! LOL...I'm glad you put that gluten disclaimer in there! For a second I was thinking, "WAIT!!!! Kirin is GLUTEN-FREE????!!!!!" and getting all excited. My thoughts exactly! GLUTEN FREE! Tell! A beer slushy would sound good on a really hot day. Love your lazy sushi, that is my kind of making sushi! Give me all the sushi. I like it all...though I always save my favourite bite for last - which means a piece of salmon sashimi. Also - Kirin will always remind me of drunken nights in Japan, both at restaurants and in random places after buying a growler of Kirin from a vending machine. But, they need to be casual. you will not have any luck at a complicated French eating place. Think fun, informal restaurants, with an issue that is something however fancy. A 50's diner might work, and smaller eateries and alimentation joints area unit sensible candidates, too.If you want to read more about Honor box routes then please click here to continue.